Nurses picketed outside Wilcox Hospital yesterday on the first day of their strike. 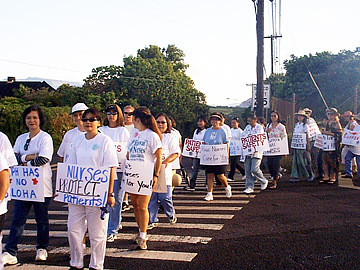 LIHUE » Just before 7 a.m. yesterday, Kauai nurses reluctantly started a walk -- the short distance from their strike headquarters to the picket line fronting Wilcox Memorial Hospital. While the first day was peaceful and orderly, both sides say they hope the strike will get the other side back to the bargaining table. 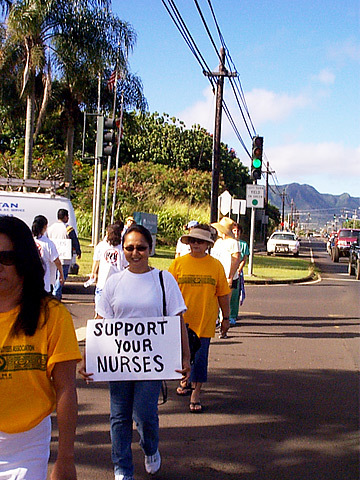 Even so, the hospital's administration and the Hawaii Nurses' Association are preparing for perhaps months of nurses picketing in front of the hospital instead of caring for patients. Inside, 40 replacement nurses from the mainland have been flown in and have been trained to take the Kauai nurses' place, with an additional 20 nurses on the way this week. It business as usual inside, administration officials said. "We had to do what we had to do," said hospital spokes-woman Lani Yukimura. "We have to remain open" for the community. Union members walking the picket line say they're striking so that patient care gets better at Kauai's biggest and only full-service hospital. But Kathy Clark, chief executive officer of the hospital, herself a registered nurse, says there's no reason to strike. "There isn't anything there that, as a nurse, is worth striking over," she said. The main issue is the current system used to determine the amount of nurses on a given shift. It is based on the amount of patients and their needs. Clark, who created the system, said it's on par with other hospitals around the state. But the nurses say the current system causes problems with patients. Also still on the table are on-call procedures for operating room nurses. "The present system is not working," said Liza Desmond, a fourth-floor surgical nurse. "Medications are late (and patients have to stay longer). We don't like to say it, but it happens." Clark's system only counts "bodies," Desmond said, not the person's qualifications. Even if there's plenty of staff on a floor, RNs are the only ones able to perform certain procedures, like administer intravenous medication and start orders from a physician. They also have to oversee others' work. "It looks on paper that we have enough nurses, but it puts a lot of stress on medical and surgical RNs," Desmond said. In a small hospital like Wilcox, "it's a domino effect," said Tracy Okamura, an operating room nurse. When RNs are busy, it makes licensed practical nurses pick up the slack and keeps patients from getting immediate service on occasion. They want a system that not only takes into account patients and their care needs, but also the skill level of the staff. Picketing nurses outside Wilcox Hospital yesterday on the first day of their strike forecast a lengthy stay. Meanwhile, the nurses say the acrimony between the administration and the union has grown to where they can't trust their bosses. "Last contract, we were assured of a (new) system," Desmond said. "Three years later, we're in the same place." Richard Stevens said he was apprehensive to come to work Thursday after being threatened by his boss. He said his supervisor told him to clear out his locker and hand over his badge or the police would be called and they would be arrested. Management also decided to stop paying for medical benefits for the striking workers. "They've pulled some really sly tactics," said Donna Gange, an operating room nurse and single mother with four kids. "We were willing to negotiate all the time, but they walked out, a-huffing and a-puffing." Clark disagreed that the administration is playing hardball, and said no one has walked out on any meeting. The federal mediator scheduled the meetings, she said. "We treat our nurses with dignity and respect, and that hasn't changed," Clark added. As for patient care, Clark said there have been three systems for patient care in the past five years. And, despite the fact the nurses agreed to the last system, they changed their mind once contract negotiations began. "Our (current) system is based off Straub" plus two others, Clark said, adding that the system was put together with members of the nursing union. "We had a tentative agreement that we would bring in experts" to discuss a new system, she continued. Desmond countered that they've heard the promises before and won't come back until there's a real system in place. It comes down to parity. The administration is willing to pay nurses at Wilcox the same as the other three Hawaii Pacific Health institutions on Oahu, but want the some of same rules that apply to nurses over there as well, including the on-call rules. But nurses on Kauai say Wilcox is from the Oahu hospitals. They're specialized and have a lot more nurses, while Wilcox takes care of cancer and surgery patients, the elderly, emergency trauma and just about everything else that can happen to a person on Kauai.